Just a handful of photos from the Boys Track Invitational held last Saturday. When photographing track invitationals you have two options - either stay all day and move around the field in "Where's Waldo" mode hoping to spy someone from your school, or go for a little while just to get the color shots. I always opt for the latter choice. These are very colorful events, with every school in the section participating, so you will get some shots you can't get at a normal meet. On the other hand, if you're hoping to photograph athletes from your school you're in for a frustrating day; better to save those shots for a normal meet. This was another chilly day (as you can see by the shots of folks in the Commack tent) so the stands, occupied mostly by athletes, were a little sparse. Basically, I'm going for wide shots to try to emphasize the number of athletes spread across the field. 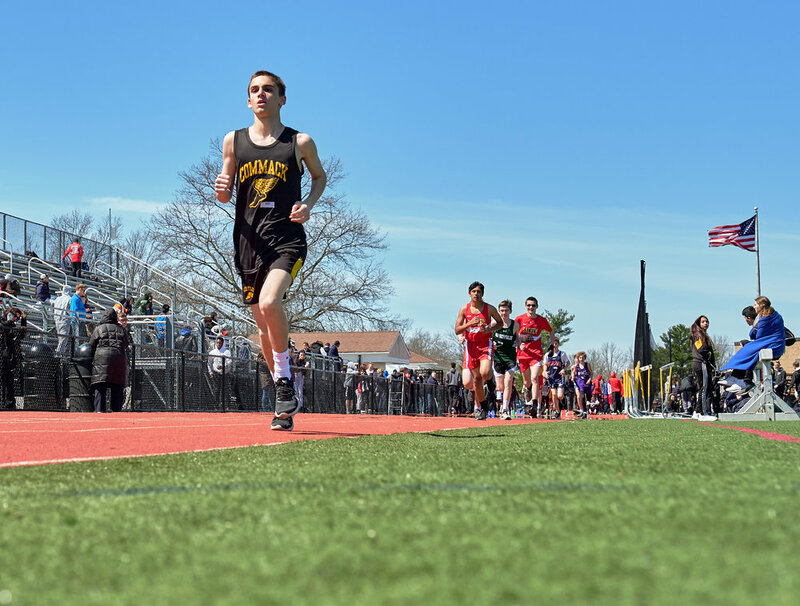 If the photo gods are smiling on me I may pick up a Commack athlete in an event, as I did for a couple of shots here. This is one meet where shooting from the stands has its advantages. It lets you show the number of athletes involved and, under better weather conditions, a fair amount of spectators also. It's a cool event to photograph if you just take what presents itself to you.